I belong to a community that has never come into being, that thruout history I find just "coming into being" ... I am not my character, my personality, my mind, my psyche, my spirit, my body, but as in the writing. The division of Duncan's mature writing life, from 1958 to 1988, into the two periods, "middle" and "late," is in some respects too neat, but the publication record, with Duncan's 1968 vow to publish no books of new work for fifteen years following the appearance of Bending the Bow, makes such a break seem natural, and even inevitable. He did, of course, publish new work in various places in the course of those years, some of it privately (like his Prospectus for the prepublication issue of "Ground Work," which included the first section of "Santa Cruz Propositions"), some of it in limited-edition pamphlets (like Achilles Song), as well as in magazines and broadsides. All of it was issued in short print-runs, none of it with a trade publisher, and the limited availability of that work suggested to many readers of poetry that Duncan had after 1968 more or less given up writing poems in order to explore other forms and genres-sundry essays and reviews, as well as installments of The H.D. Book, which began to appear in July 1963. Nevertheless, in 1968 Duncan's position as poet was far more secure (and even for that matter far more public) than it had been ten years earlier, when he published Letters. In the putatively unproductive years preceding the publication of Ground Work: Before The War in 1984 he was not, despite some bouts of ill-health, any more idle than he was silent, what with his busy schedule of lectures, symposia, readings, teaching commitments, essay writing, and extensive tours. If Letters (1958) marked an important new departure for Duncan, as I suggested in the Introduction to The Collected Early Poems and Plays (CEPP), the 1960 publication of The Opening of the Field put Duncan on the map, and marked a crucial expansion of the possibilities the earlier book had opened up. The writing of the poems in the two books, indeed, overlaps. As Duncan observed in 1974: "There's no total book in process in Letters.... I started out from the very first poem in Opening of the Field to compose a book,"-he initially planned it as fifty poems (the finished book actually has fifty-three)-"so process is at work in the whole book." "Composed" is the key word in Duncan's hindsight comment: while he attempted in The Opening of the Field and the two subsequent books, Roots and Branches (1964) and Bending the Bow (1968), to compose each poem as a "projection" both from the poems in the collection already written and of those to come (and thus a projection of the total book), he was of course unable to anticipate major shifts in his own capabilities. His excited discovery in late January 1957 of Alfred North Whitehead's Process and Reality (through Charles Olson; discussed in some detail below) significantly amplified and modified his poetic practice. He was unable to resolve to his own satisfaction the formal challenge this shift posed to the book as a whole: if the poem must, as testimony, be true to its own history, then the rules of the game did not permit the wholesale rewriting of the poems he'd already written (and published). Rules, of course, are to be broken, and a year after he started reading Whitehead, in the summer of 1958 Duncan laboriously reworked "Often I Am Permitted To Return To A Meadow," which had already appeared in Ark II/Moby I (1956-1957): 10. Since the poem was to be the first in the book, setting up the themes, the tone, the feel of the book, the need for re-vision of this visionary poem was clear, and the result was one of the best-known and perhaps most anthologized of all Duncan's work. That opening poem is balanced by "Food For Fire, Food For Thought," which closes the book. There is a wide range of poems between them, of which perhaps the most celebrated is the much anthologized and influential "A Poem Beginning With A Line By Pindar"; with its combination of ancient mythology and contemporary politics the whole poem arises, as he said in The Truth and Life of Myth, from puns: "my mind lost hold of Pindar's sense,... so that the words light, feet, hears, you, brightness, begins, moved in a world beyond my reading, these were no longer words alone but also powers in a theogony, having resonances in Hesiodic and Orphic cosmogonies where the foot that moves in the dance of the poem appears as the pulse of measures in first things." The work in The Opening of the Field is wide ranging and includes visionary ballads ("The Ballad Of The Enamord Mage" was written before Duncan read Whitehead-he would write others later), elegies (as in "A Storm Of White," written on the death of his cat), homages to masters (Zukofsky, in "After Reading Barely And Widely"), and, perhaps most far-reaching in terms of the evolution of Duncan's oeuvre, the "Structure of Rime" series (discussed below). Roots and Branches (1964) builds on the ground that Duncan's unfolding mature voice and major themes established in The Opening of the Field, not only through further homages (to Blake, for instance, and to Shelley and Spicer) but returning to and developing forms, themes, and genres initially explored in his earlier work: "Come Let Me Free Myself" for instance revisits a mode first explored in Heavenly City, Earthly City; "Adam's Way" is a theosophical play; "Two Presentations" and "A Sequence of Poems For H.D. 's Birthday" are overtly autobiographical and link H.D. to the lifelong mythological and cosmological predilections of Duncan's poetics, characteristic of this whole book (in April 1960 Norman Holmes Pearson had commissioned Duncan to write The H.D. Book, a project which occupied him throughout the writing of Roots and Branches, and indeed beyond). The poems arise, perhaps more obviously than in The Opening of the Field, from the public as well as the private circumstances of Duncan's daily life: "What Happened: Prelude" was written during a quarrel with James Broughton over the staging, publicity, and performance of Helen Adam's San Francisco's Burning in December 1961 (for details, see the notes to the poem); the casting of Broughton as "Mr Fair Speech" and Kermit Sheets as "his cousin By-Ends"-characters in John Bunyan's Pilgrim's Progress-made the quarrel public, though it was not published until almost four years after the event. Profoundly original yet insistent on the derivative quality of his work, transgressive yet affirmative of tradition, Robert Duncan (1919-1988) was a generative force among American poets, and his poetry and poetics establish him as a major figure in mid- and late- 20th-century American letters. This second volume of Robert Duncan’s collected poetry and plays presents authoritative annotated texts of both collected and uncollected work from his middle and late writing years (1958-1988), with commentaries on each of the five books from this period: The Opening of the Field, Roots and Branches, Bending the Bow, and the two volumes of Ground Work. The biographical and critical introduction discusses Duncan as a late Romantic and postmodern American writer; his formulation of a homosexual poetics; his development of the serial poem; the notation and centrality of sound as organizing principle; his relations with such fellow poets as Robin Blaser, Charles Olson, and Jack Spicer; his indebtedness to Alfred North Whitehead; and his collaborations with the painter Jess Collins, his lifelong partner. Texts include his anti-war poems of the 1960s and 70s, his homages to Dante and other canonical poets, and his translations from the French of Gérard de Nerval, as well as the complete Structure of Rime and Passages series. Robert Duncan (1919–1988) was a foremost figure in the San Francisco Renaissance and is considered one of the most accomplished and influential postwar American poets. He became a leading practitioner of nontraditional open form poetry, his later work shaped by ideas associated with Charles Olson and the Black Mountain School of poetry. During his lifetime, he published more than a dozen collections of poems, including those in this volume, which remain his best-known works. 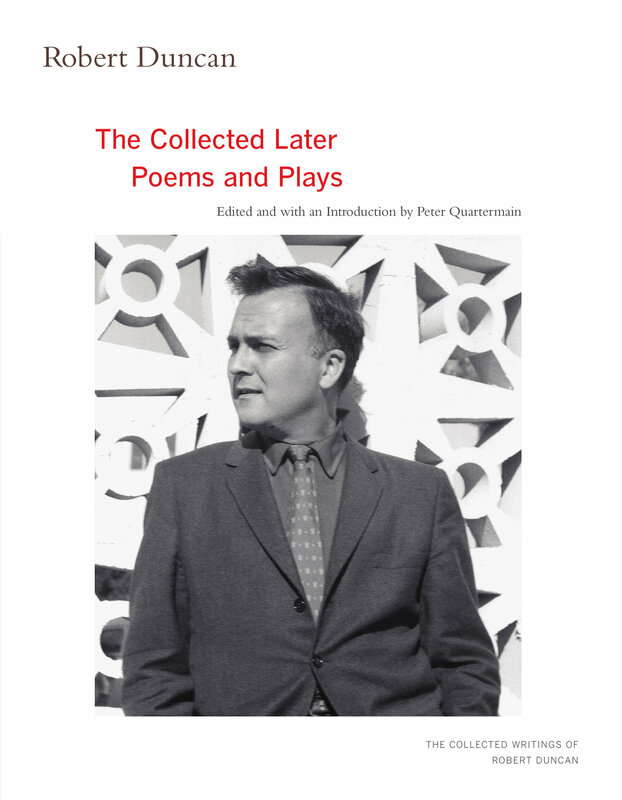 Peter Quartermain taught contemporary poetry and poetics at the University of British Columbia for over thirty years. He is the author of Basil Bunting, Poet of the North; Disjunctive Poetics: From Gertrude Stein and Louis Zukofsky to Susan Howe; and Stubborn Poetries: Poetic Facticity and the Avant-Garde. He is the editor of Robert Duncan’s Collected Early Poems and Plays (UC Press). What Do I Know of the Old Lore? We heard it as a cry. It was the Word. 2. Sir Walter Ralegh, What Is Our Life? We Convivial in What Is Ours!